NO MORE THAN 5 PER GROUP 1. After all members of the party have teed off, the one closest to the hole will putt first and continue to putt until ball is in the cup or until max strokes per hole has been reached. 2. Maximum strokes per hole is 3 times PAR. 3. If a ball leaves course it must be returned to carpet at point of departure. PENALTY - ONE STROKE If the ball in not accessable you may return to the front counter for a replacement ball. 4. If ball rests against a curb it may be moved in 6 inches. 5. Players ball shall be played or lifted out of the way upon request of another player. 6. If ball is hit by another ball, the hit ball may take either the new or old position. 7. It is strictly against the rules to play anywhere except on carpet. 8. Holes may not be replayed. 9. A group not wishing to hurry their game must allow following group to play through. 10. 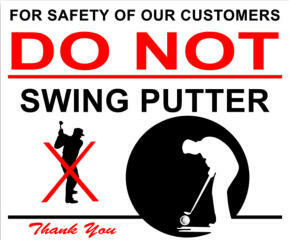 For the safety of our customers DO NOT swing putter above the knees. 12. No climbing on or under the fencing. 13. No standing / balancing on golf structures such as planter boxes, walls of the holes, benches, etc. 14. Keep all body parts out of the fountains and flower/bush beds. 15. 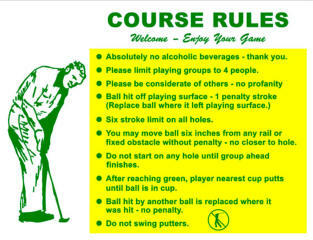 No throwing of golf balls, clubs, rocks, etc. 16. 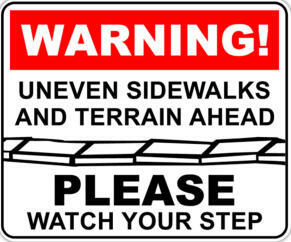 Caution: Uneven surfaces throughout golf course. Please watch your step. NO MORE THAN 5 PER GROUP 1. After all members of the party have teed off, the one closest to the hole will putt first and continue to putt until ball is in the cup or until max strokes per hole has been reached. 2. Maximum strokes per hole is 3 times PAR 3. If ball leaves course it must be returned to carpet at point of departure. PENALTY - ONE STROKE 4. If ball rests against a curb it may be moved in 6 inches 5. Players ball shall be played or lifted out of the way upon request of another player 6. If ball is hit by another ball the hit ball may take either new or old position. 7. It is strictly against the rules to play anywhere except on carpet 8. Holes may not be replayed 9. A group not wishing to hurry their game must allow following group to play through 10. For the safety of our customers DO NOT swing putter above the knees 12. No climbing on or under the fence. 13. No standing / balancing on golf structures such as planter boxes or benches 14. Keep all body parts out of the fountains 15. 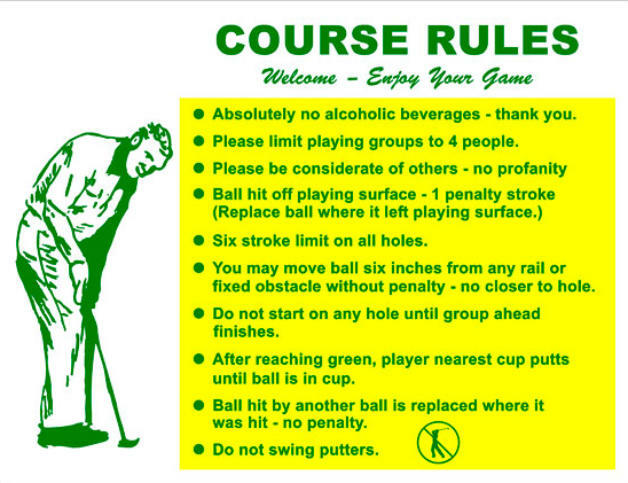 No throwing of golf balls, clubs, rocks, etc. 16. Caution: uneven surfaces throughout golf course. Please watch your step.